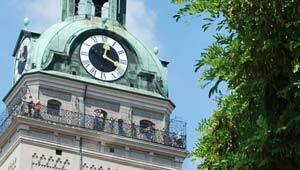 Peterskirche in Munich, also known as Alter Peter, is slap bang in the city centre and it opens its tower to tourists. The view from the tower is terrific, and is probably the best option for seeing Munich’s skyline, but it is quite a climb and there is no lift. In every direction you turn you can see historic Munich landmarks including the famous view of the Frauenkirche with the Olympic park and Olympic tower behind. There are also great views of the Rathaus, the market and Marienplatz. The big thing you notice at the to is just how red the rooftops of Munich are! Your visit to the tower will not take long unless there is congestion on the stairs, but it is well worth it.